John Bromfield is Curt Darrow, a deputy marshal sent to investigate a murder most foul. 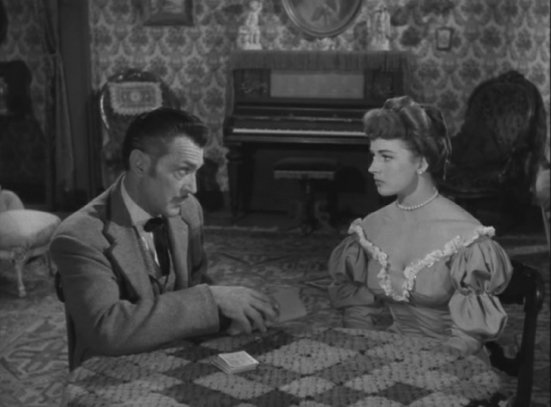 Sylvia Melbourne (Coleen Gray), a wealthy and lovely young businesswoman and gambling house owner in the town of Fairweather, has been shot then her body was burned beyond recognition in a subsequent fire. 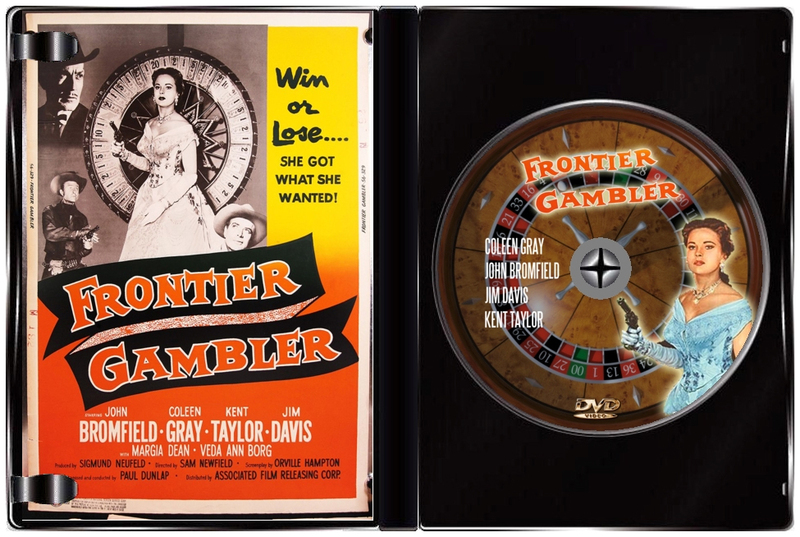 The lead suspect is a gambler named Duke Chadwick (Kent Taylor), who adopted Sylvia as a young girl after her parents were killed in an Indian raid. However, it was no ordinary father/daughter relationship as Chadwick set about molding Sylvia into his idea of a perfect woman - and once she has grown into a smart, ruthless and beautiful woman, he desires her love in return. Only, the feeling of romance was far from mutual. Chadwick, though, is not the only suspect - there’s also Francie Merritt (Veda Ann Borg), owner of the Lazy M Ranch. She is in love with a no-good gunslinger named Tony Burton (Jim Davis); he in turn loves Sylvia. And there’s newspaperman Tom McBride (Roy Engel) who had launched a crusade against the gambling houses in Fairweather before Sylvia bought out his newspaper in an attempt to control what he prints. Just as Darrow thinks he’s making progress on the case, Sylvia shows up, lovely as ever and very much alive! 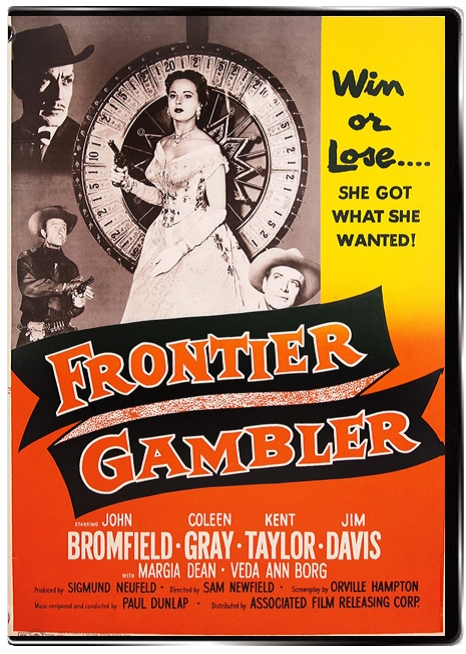 An extremely interesting film that seems to be remake of the 1944 film noir "Laura" with a Wild West setting, Frontier Gambler is made with such style and intrigue that it certainly rises above it's low budget roots. Sometimes referred to as "the Citizen Kane of bad movies," production values are fairly lavish by "B" standards, with some very skillful use of stock footage in the Indian attack and effective utilization of some appropriately colorless natural backgrounds. 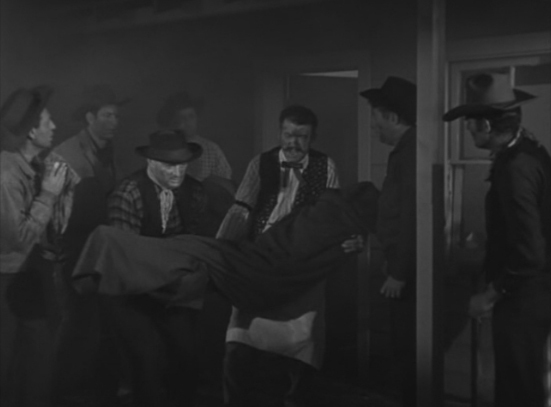 The setting of the wild west for a noir can only be described as ingenious, but more fascinating still are the characters fleshed out in the story. My congratulations to Miss Gray and Mr. Taylor, and Jim Davis always brings his A game whether playing the hero or villain.